← Bread Baking Babes turn 3! I was sure they would be gone by December. At the very latest the middle of January. They're only supposed to 'keep well for 4 or 5 months'. I've made soups, made purée to use in my Christmas Breads, roasted, steamed and fried it. I've sliced it, chopped it, cubed it, shredded it and mashed it. I've made risottos and stews. I swear it's breeding down in the dark of the cellar. Whenever I send mon mari down for another one, (I don't go into the cellar… did once, that was enough) I keep hoping he'll say it's the last. He always says there are 'lots left'. If I just use it as a vegetable side dish, one decent squash will be good for 5 or 6 meals. We've eaten 1 butternut squash per week since September. I long for a cauliflower or some Brussels sprouts or maybe a few sunchokes. But, the squash won't keep forever…. And while it's still good, we'll eat it. The 'By God I grew it we damn well are going to eat it' menu plan. I really believe that the masses were fed with squash (both butternut and zucchini) and not the loaves and fishes some claim. Maybe, just maybe, I'll only plant two vines next year, rather than three. That would be the prudent thing to do. Than I'd only have one vine. That wouldn't be nearly enough. Better plant three again…. maybe four, just to be safe. Heat oil in a tagine, heavy pot or Dutch oven with tight-fitting lid. Add lamb and brown on all sides. Remove and set aside. Add the shallots, garlic, paprika, cumin and sauté until tender and starting to brown, about 5 minutes. 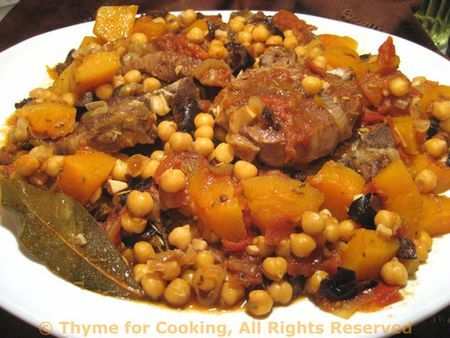 Return the lamb to the pot, add herbs, wine, tomato, chickpeas and squash. Cover, turn heat to low and braise for 60 minutes. Pit olives and roughly chop. Stir into stew. Spoon meat and vegetables onto a platter and serve with Couscous. At the rate we're going, we'll finish the butternut in time to start eating the summer zucchini. Did I mention that I also have a lot in the freezer? For when we run out of the fresh? Looks delicious! I often cube mine and throw them into Indian-inspired curry “stews”, usually with tofu as a base instead of meat (purely because I haven’t remembered to take any out of the freezer on time!). Oh Katie, I hear you! What I finally did, was roast my squash, puree, then I froze it in 1 1/2 cup amounts. 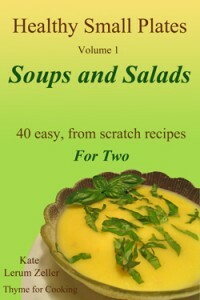 It freezes really well, so down the road can be added to pastas, soups, stews. We go a couple of weeks without squash, then it is a delight to have. p.s. just think of all that beta carotene and healthy benefits you guys are getting! You just made me smile. I don’t know what I would have done with that much butternut squash but I guarantee you’ve been a lot better at putting them to delicious use than I would have. Take this tagine, for example. I’d love to be having this for dinner right now. Looks so good! We eat about one butternut a week, in soup especially. Funny you should mention this. Just yesterday, after digging out my driveway from under the three feet of snow, I wanted something nutritious and warming. I decided on chana masala, But, since I also have tons of squash to get rid of, I also decided to add butternut. The only difference is that mine is peeled, cubed and frozen. It’s great; it adds flavor, fiber and she-who-must-be-obeyed loves it. Tomorrow it’s off to Turkey. I could never ever tire of bnut squash. So if you ever want to send any over here…my mailbox is always open. I love the sound of this recipe! I’m all about middle eastern flavor lately. Delicious. You still have zucchini in the freezer? I know what I’d do with it: Compost!! Cut them up, sprinkle them over your garden and return their goodness to the earth as fertilizer – then, go out and get thee some other veggies! Gee, I always get carried away with the ‘what ifs’… I’m thinking I’ll try some buternut gnocchi this weekend. As to curry – long, long story…. Robin, mine have been going in to just about everything…. including the dog! Baking Soda – a pizza vine – I like that. I’d plant 5…. Thanks, Jean… I could send you some…. brassfrog, have a wonderful trip! I didn’t freeze any in cubes, must try that! Joanne, I’ve been having a lot of fun with my Moroccan cook book! Elizabeth, the trick to growing zucchini is never, ever, ever let them get bigger than 4 or 5 inches…. They taste a lot better, too.